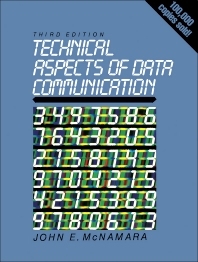 Technical Aspects of Data Communication, Third Edition provides information pertinent to the technical aspects of data communication. This book discusses a simple asynchronous interface implemented with a specialized integrated circuit called a UART. Organized into 28 chapters, this edition begins with an overview of the interface standards ranging from the classic EIA-232-D to the EIA-530. This text then describes modems and modem control, with material on high-speed modems and error-correcting modems. Other chapters discuss hardware and software methods. This book discusses as well digital transmission systems and the Integrated Service Digital Network (ISDN). The final chapter deals with local area networks (LANs) and shows how data communication is the key to information and resources sharing in modern networks of personal computers and work stations. This book is intended to be suitable for readers who are about to design a data communication system, are about to purchase a program data communication hardware, or are just interested in learning more about data communication.